The Baylor Scott & White Medical Center is a 129-bed capacity, state-of-the-art hospital that replaced the century-old Baylor Waxahachie located in Waxahachie, Texas. More than double the size of the former center, the new, technologically-advanced facility features expanded women’s health services and a dedicated cancer center connected to the hospital – a first for Ellis County. The hospital provides care options for the current community and allows for expanded growth to meet future healthcare needs. 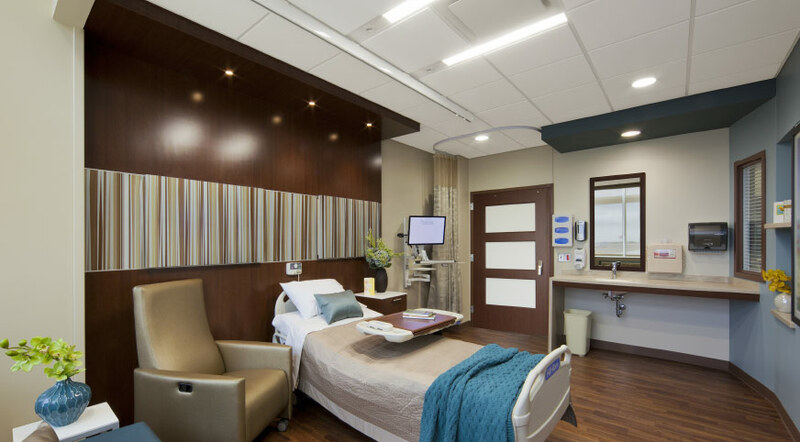 CallisonRTKL helped the medical center achieve its goal of creating a holistic healing environment by sourcing Móz Metals to manufacture an aluminum headboard feature that adds a whimsical, linear pattern and a cool, reflective surface to patient rooms. The Flare pattern in Earth derives from the Graphix Collection, a line of multi-layered printed metal surfaces inspired by timeless textile patterns. The aluminum metal is sealed with a Polycoat Gloss finish, which creates a durable plastic barrier that can be easily sterilized within a healthcare environment. The architectural metal element inside each patient room at the Baylor Scott & White Medical Center helps reinforce the design concept and improve the health, safety and welfare of patients, staff and visitors.